My one group photo, taken on my camera by Harvey, at the delightful Riad Maryam. After getting a better look at our hotel in the daylight, we took off to the far side of town (really, maybe 1.5 miles away, tops) for the open air market. We had time to wander by ourselves through the used clothes, and then the more interesting produce (seeing the items we had seen growing along the road yesterday), spices, and the livestock. We then went inside the kasbah, and into the souk. After some wandering around, we visited two antique shops apparently run by the same people. I am getting tired of being herded to certain shops (where our local guide probably gets some sort of commission), where the men working there hover non-stop, trying to make a sale with their promises of “we have good price.” Twice today, the guy tried to put a necklace on me that my mother tried on, and both times I quickly backed off, and said No. I know it's their way, but I take it as an invasion of personal space! Finding the place for lunch at first was a bit dubious, as we were walking through some back alleys to find what turned out to be the incredibly lovely Riad Maryam, named for the proprietor's daughter, who was our server. It was a beautiful courtyard, with a long table set up for us. And when they say lunch is the main meal of the day here, they're not kidding. It all begin with a pureed vegetable soup with fish stock (I think) in it. Then sauted young zucchini with a light tomato sauce. Then came the baby eggplant. Then a big mixed vegetable plate (all cooked), with carrots, cauliflower, beets, potatoes, green beans, and I think parsnips. Then a chicken kabob for each. Then a fava bean & green pea salad. Then a salad of cuke, tomatoes, and what was probably green bell peppers, or an extremely mild green chile. Then kefta kabob for each. At this point, we were all fairly full, but suspicious, because they hadn't removed our dinner plates yet. 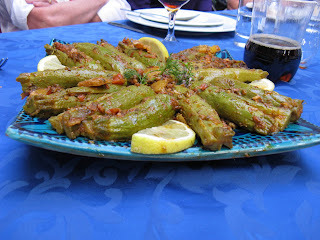 Then they brought out the tagines, and at that point, we told them we simply couldn't eat any more. I HOPE we did not insult them by refusing their main course, but everything up to that point was delicious, but it was a crazy amount of food! So we asked them to bring dessert, expecting fruit or a cookie. Maryam brings out this gorgeous layered dessert; Our guide called it a jowhara, meaning “jewel”, and that is was! (Looking at my book on Moroccan foods, I am pretty sure this fantastic thing is called a keneffa.) It was like traditional French crepes, flash fried, so they were crispy, layered with a light pastry cream with cinnamon, honey, peanuts and almonds in between the multitude of layers. It looked beautiful, and tasted even better! A superb treat, and their hospitality was wonderful. 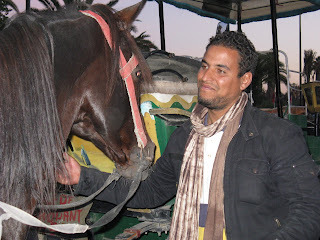 Back to the hotel for a bit, and then we took carriage rides around the kasbah. I got to be one of the lucky ones and sit with the driver. Fortunately (or not) my driver was young, 32 to be exact, and rather handsome. But he was definitely interested in meeting me later for coffee or tea, and showing me the town. Very persistent! And even though I said I was traveling with my mother and aunt, he kept saying how beautiful I was and how he would wait for me after the group's dinner. Blah, blah, blah. Very persistent though...He asked if I had a boyfriend, and I said yes. I was prepared to tell him my boyfriend's name was Charlie, and just leave out the fact that he has 4 legs and a furry tail! This town seems to be the place for men, as the hotel porter, Abdul from Mali, whom I was talking to about Obama, asked me if I had a boyfriend.